the transcontinental affair: modern mermaids. 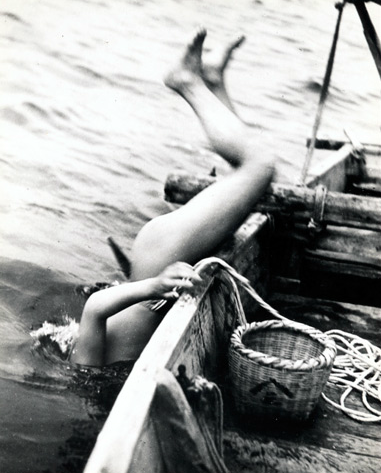 'A Japanese ama goes overboard in search of shellfish in the 1930s. For centuries these female free divers worked the country's coasts without much clothing, but that changed: "Except for a few older women, the ama of Hekura no longer dive semi-naked," wrote Luis Marden after visiting one group of divers. His July 1971 Geographic story, "Ama, Sea Nymphs of Japan," goes on to say, "The girls wore black leotards. Most others wore all-enveloping suits of black neoprene, the diver's wetsuit." There aren't many ama left in Japan. Most who remain are middle-aged or older; divers sometimes work into their 80s. Today few young women care to take the plunge'. for the love of erin.